Theatrical Bouquet tapestry shows an extravagant scene of flowers in an urn, with a dramatic red drape surrounding. Based on the floral botanical studies of the 18th century, which showed the beauty of flowers in a vast array of ways, we see a gorgeous work here of the floral still life. Here we see a vase of flowers in full bloom including a striped tulip, and textured peonies, in the setting of the countryside. Surrounding this scene are columns and a red drape and faux tassels. A superb work showing the beauty of French floral botanical studies. 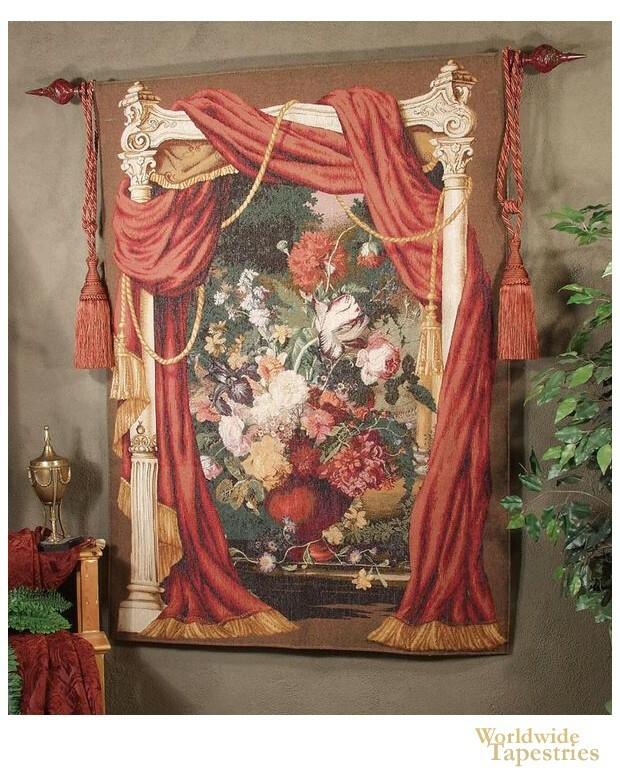 This French tapestry "Theatrical Bouquet" is backed with a lining and has a tunnel for easy hanging. Note: tapestry rod and tassels, where pictured, are not included in the price.